The Arepa Place specializes in a Colombian and Venezuelan dish known as arepas. We were founded in Cincinnati in 2016 by owner, Isis Arrieta-Dennis, who is originally from Colombia. She and her mother (also named Isis) are responsible for all the recipes. After more than two years of using Findlay Kitchen and serving food on the weekends from a pop-up tent, we opened our first brick-and-mortar at Findlay Market in October 2018. We have immense passion for the cuisine that we create and the experiences that are shared over food. We love serving the people of the Greater Cincinnati area, and we hope everyone enjoys our authentic Colombian dishes. Thank you for visiting our website, and we look forward to seeing you soon! 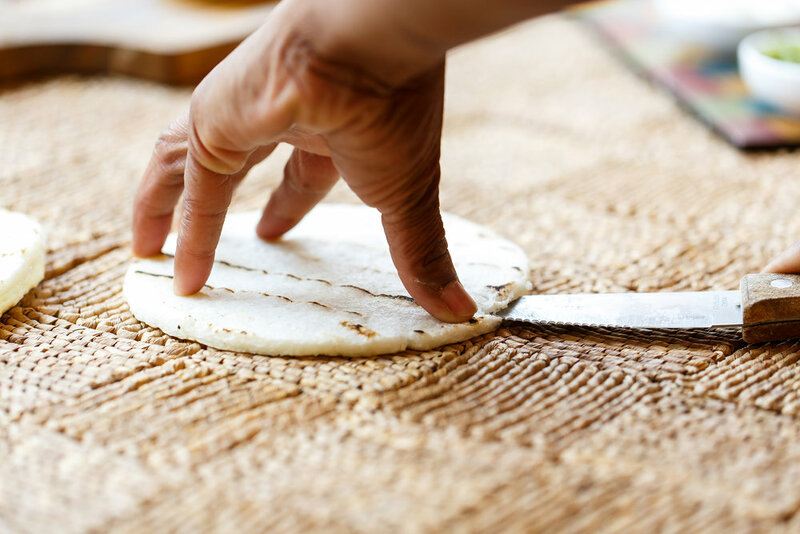 Our stuffed arepas are made the traditional way! First, we boil and grind the corn. After kneading the dough, we make the patties that are then grilled. Lastly, the arepa is cut open and filled with your choice of mozzarella cheese, black beans, fried plantains, shredded beef, chorizo, and/or chicken. We even serve delicious breakfast arepas! 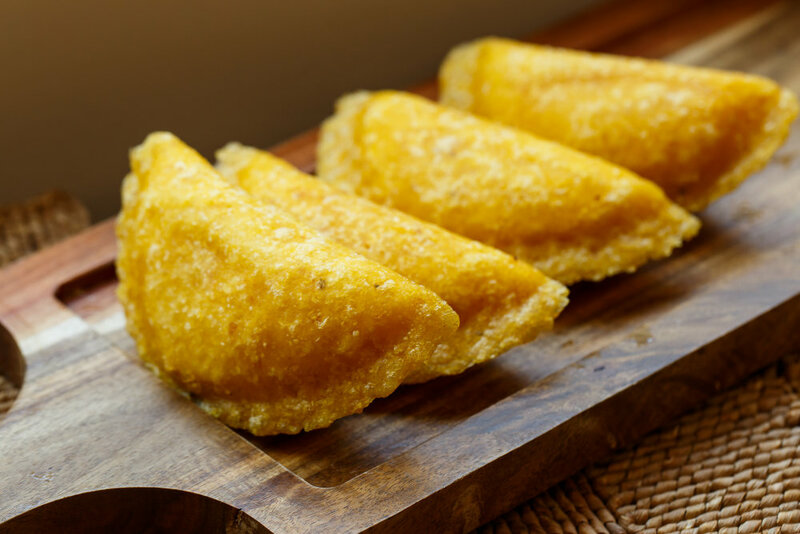 Lastly, we also serve delicious empanadas made from freshly ground corn. These corn pockets are stuffed with mozzarella cheese, shredded chicken, ground beef, or potato and eggplant before being deep-fried. FINDLAY MARKET 131 W. Elder St.
add: black beans, cheese, fried plantains. Sugarcane water with lemon. It's the Colombian lemonade! .Celebrate Latin music, dance, and food at Fountain Square during Cincy Cinco! Our arepas and empanadas can be found in the Hispanic frozen foods section at Jungle Jim’s (Fairfield and Eastgate). If you would like to place a special order, please send us an email and you can purchase packaged arepas and empanadas from us at our storefront or any of the above-mentioned locations. City Flea takes place once a month at Washington Park where visitors enjoy live music along with a wide variety of products, foods and drinks. Our specialty arepa, grilled, sliced and filled with your choice of chicken, chorizo, beef, fried sweet plantains, cheese, and black beans. 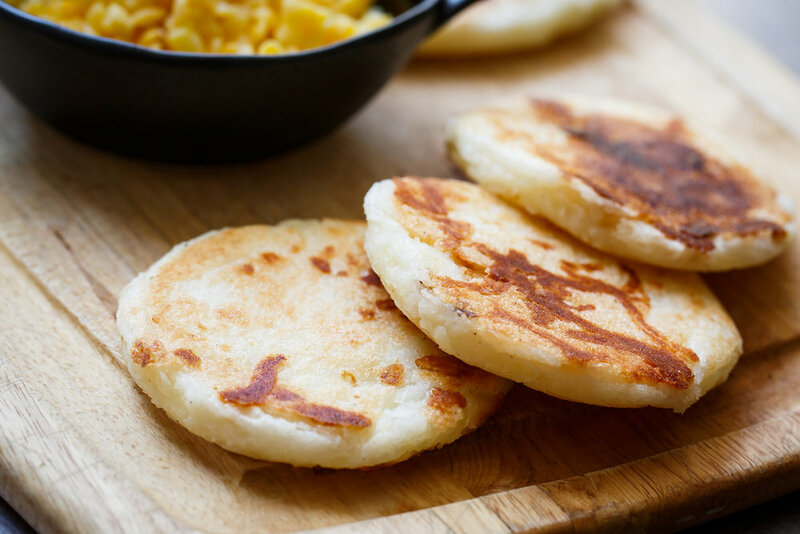 Fluffy arepas made by mixing mozzarella cheese into the corn dough before grilling the patties. It’s the Colombian grilled cheese! 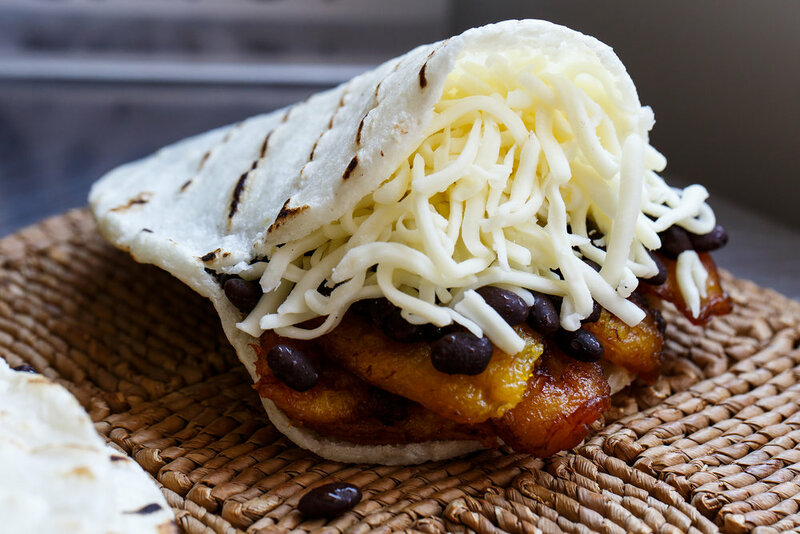 The cheese arepa topped with your choice of chicken, chorizo, beef, fried sweet plantains, and black beans. Made from freshly ground corn, these deep fried corn pockets are stuffed with your choice of cheese, shredded chicken, ground beef, or potato and eggplant. A little something to add on top of your arepa or empanada, all of our salsas are home-made with fresh herbs and vegetables. Fried sweet plantains, plantain chips and salsa or guacamole. Our catering service includes foil envelopes used to wrap the arepas, napkins, plates, and forks. We can also bring tablecloths and serving tables, if necessary. 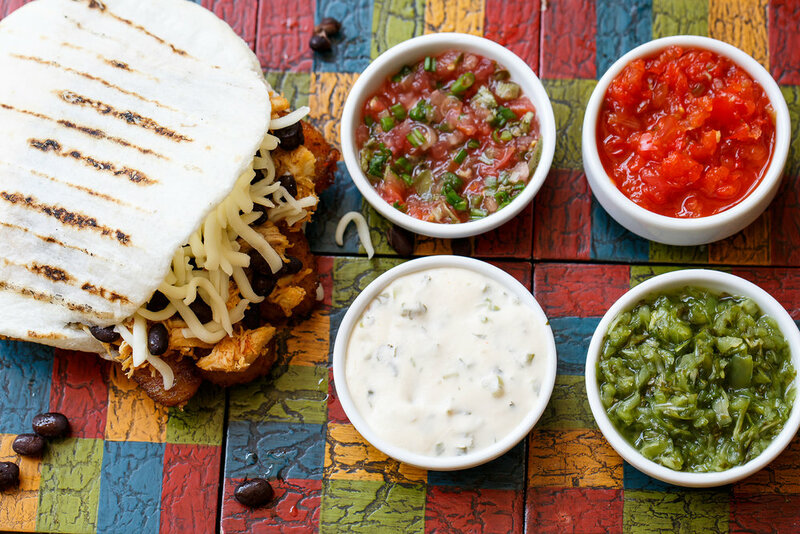 Each arepa comes with (4) different salsas on the side. One or two staff members from The Arepa Place will prepare and serve the food. To secure your reservation, we require clients to pay 50% of the invoice in advance. We charge $12 per person, in addition to a 20% service fee and a 7% sales tax. If cancellations are made at least seven (7) business days prior to the day of the event, a full refund will be given (this includes the 50% down payment). If the catering is cancelled fewer than seven (7) business days prior to the date of the event, there will be no refunds.